Sanitary Thermowells are generally chosen for an application based on corrosion conditions, surface finish, mechanical size requirements, and accurate thermal transfer. Omega Sanitary Thermowells can be configured from the options below to meet your clean in place or sanitize in place application needs. This technical reference, Introduction to Sanitary Sensors contains addition application and installation details regarding the use and application of Sanitary Sensors and Sanitary Thermowells. Sanitary Sensors can be selected to match your well dimensions. See the related links below. Most Omega temperature instrumentation with sanitary process connections can be sized and configured to fit your thermowell or CIP needs. Food process hygienic temperature sensors and thermowells can be used to aid food safety inspection compliance and verification of time temperature control. Combined with a chart recorder model CTXL you can temperature monitor a CCP ( Critical Control Point) or sanitation time and move toward a HACCP (Hazard Analysis Critical Control Point) compliance plan. Application: ¼ or 3/8" diameter stem, bimetal thermometers; RTD or TC temperature sensing instruments having 0.252" (S-260 models) and 0.377" (S-385 models) maximum diameters, #20-gage thermocouple elements. Applications: Sanitary Thermowell for CIP , food and beverage, pharmaceuticals, research. Connection Size: 1½" Tri-Grip (Tri-Clamp® compatible) (cap size) is standard. Other Tri-Grip sizes are available upon request. Materials: 316 stainless steel. Custom wells are also available in special materials, other Ra or special finish, prices on request. 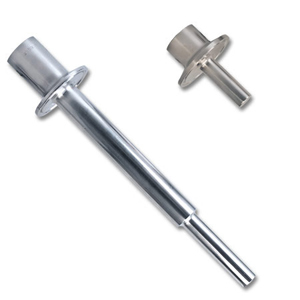 S-260 Series Thermowells with 0.260" Bore Dia. S-385 Series Thermowells with 0.385" Bore Dia.